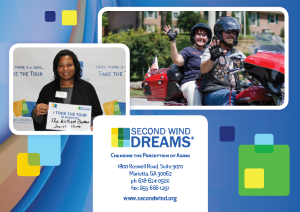 Second Wind Dreams® (SWD), Inc. has been approved by the Centers for Medicare and Medicaid Services (CMS) to use Civil Money Penalty funding (CMP) in Georgia’s skilled nursing homes. The project is for 3 years total and will assist nursing home staff better identify with residents in an effort to improve care. 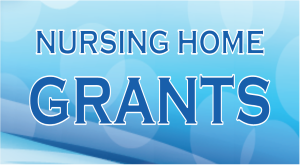 SWD will provide hands-on, experiential training in 169 certified nursing homes in the state of Georgia through the use of the Virtual Dementia Tour® (VDT). Second Wind Dreams® (SWD), Inc. has been approved by the Centers for Medicare and Medicaid Services (CMS) to use Civil Money Penalty funding (CMP) in North Carolina’s skilled nursing homes. The project is for 2 years total and will assist nursing home staff better identify with residents in an effort to improve care. 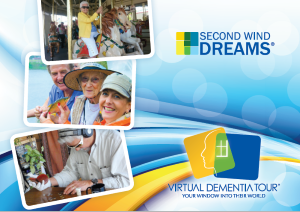 SWD will provide hands-on, experiential training in 200 certified nursing homes in the state of North Carolina through the use of the Virtual Dementia Tour® (VDT). ALL AT NO COST TO YOUR NURSING HOME! The VDT is a scientifically proven method that builds sensitivity and awareness in individuals caring for those with dementia by temporarily altering participants’ physical and mental abilities. This evidence-based program simulates changes associated with mid-stage cognitive decline. Geriatric specialist, P.K. Beville authored and created the VDT. This patented program offers hope by providing practical ways to create an environment that supports the disease and increase understanding. 70-80% of nursing home residents are experiencing some form of cognitive decline. 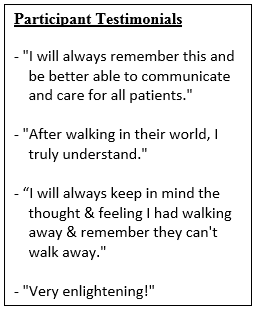 Staff reports that working with dementia residents is the hardest part of their job. The cost to care for someone living with dementia is three times higher than caring for residents who do not have dementia. CMS’s initiative to decrease psychoactive medication is opening the door for more innovative, person-centered care. Second Wind Dreams® (SWD) is an international, nonprofit organization founded in 1997. The mission is to change the perception of aging through the fulfillment of dreams and educational programs including its flagship program, The Virtual Dementia Tour®. The Atlanta-based organization has fulfilled thousands of dreams with help from many volunteers, sponsors and corporate partners. To participate in this CMS grant opportunity and for more information on how to get started, please fill out your contact information below. Once we receive your contact information, we will reach out to you directly to review next steps!